Lynchburg-Clay’s Brook Laymon attempts a block in the second set of the Lady Mustangs match against North Adams at Lynchburg-Clay High School on Tuesday. Lynchburg-Clay senior Kylie Vastine prepares to serve on Tuesday at Lynchburg-Clay High School where the Lady Mustangs battled North Adams in SHAC volleyball action. 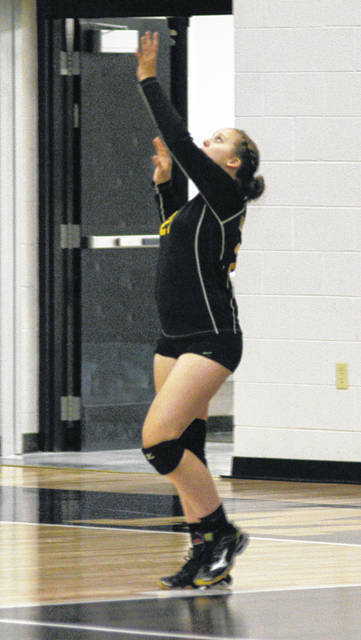 LYNCHBURG – The Lynchburg-Clay Lady Mustangs hosted the North Adams Lady Green Devils on Tuesday at Lynchburg-Clay High School but were unable to overcome the ladies from Adams County as they lost in straight sets 25-21, 25-13 and 25-21. The first set saw the Lady Mustangs break the serve of the Lady Green Devils on the initial volley and they held an early 5-3 lead. 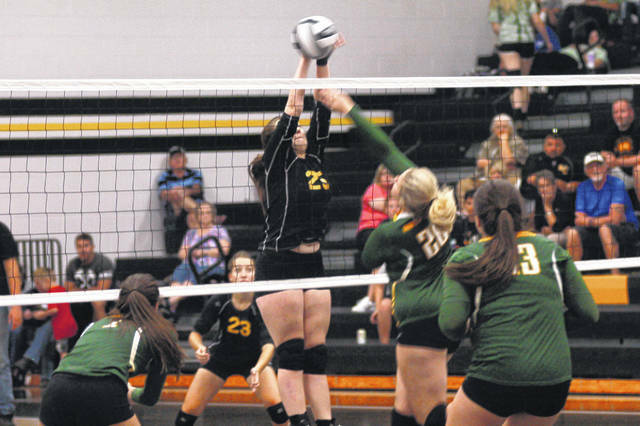 North Adams quickly regained control of the set as they took an 8-5 lead and the Lady Mustangs began to struggle containing the service game of the Lady Green Devils. Trailing 12-9 Lynchburg was able to break the serve of North Adams and rally to tie the first set at 12-12 and force the Lady Devils to call a timeout and regroup. Following the stoppage in play the teams traded points until North Adams was able to string together five consecutive points to take a 21-19 lead and force the Lady Mustangs to call a timeout of their own. Lynchburg-Clay managed to break the serve of the Lady Green Devils two more time to pick up points 20 and 21 but North Adams’ Cortney Brown recorded match point soon after. North Adams took the second set with very little effort as the Lady Mustangs were unable to get anything going in the second set and fell 25-13. Trailing two sets to none Lynchburg-Clay found their footing in the third set as they jumped out to an early 11-3 lead and looked to be in control of the set. The girls from North Adams would have none of it as they battled back to get the score to 16-13 in favor of the Lady Mustangs. Following a timeout by Lynchburg the teams again exchanged points and serves as neither team could gather the momentum needed to pull ahead. The Lady Green Devils kept the pressure on the Lady Mustangs as they forced a second timeout by Faust as he attempted to right the ship for his team. But, North Adams would not be denied and, despite a great effort to force a fourth set by the Lady Mustangs, pulled away late for the 25-21 win. “Tonight, the first set we were both right around 20 and we let it get away. In the third set we were ahead 20-18 and we let it get away. So, we are really really close we just can’t find a way to get over the hump,” Faust said. Faust was pleased with the effort of his girls tonight compared with the first matchup between the schools. “When we went down there earlier in the year we lost to the green jerseys. We were just intimidated by them. Tonight the green jerseys didn’t phase us. We played we just kind of got ourselves in a little bit of a rut at times and couldn’t quite get over the hump. It was a different team tonight mentally and I think that was good. We were playing the other team and not the other jerseys,” said Faust. The loss drops the Lady Mustangs under .500 on the year in Southern Hills Athletic Conference play with a record of 5-6 and the win improves North Adams’ record to 9-1 in the league.